The British government has extended a $500,000 (about Shs2b) grant to the Judiciary to help streamline service delivery and fight corruption through automating court processes. The grant was delivered through the Department for International Development (DFID) under Strengthening Uganda’s Anti-Corruption Response (SUGAR) project. 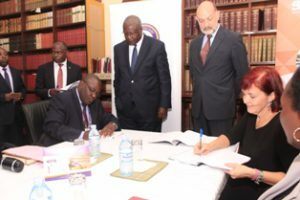 Chief Justice Bart Katureebe and Secretary to the Judiciary Kagole Kivumbi last week signed the memorandum of understanding on behalf of the Judiciary while the British High Commissioner to Uganda Peter West signed on behalf of Britain. Mr West said the money is meant to boost people’s confidence in court systems that have known to be corrupt and inefficient. Justice Katureebe thanked the British government for supporting the Judiciary in the fight against corruption. “Fighting corruption in the Judiciary and improving its image is something that cannot be done in an instant but it will be eventually reached,” he said. The Chief Justice added that automating court processes will ensure transparency for all parties and do away with systematic corruption. The Judiciary is in advanced development of an Electronic Court Case Management Information System that will serve as an online single point of entry for all parties involved in managing court cases. The system will record all case information online, from the time a plaintiff files a civil case online or in criminal matters, from the Directorate of Public Prosecution through sentence and execution and efficiently sharing information among all relevant parties in. The Anti-Corruption Division of the High Court, the Court of Appeal and the Supreme Court will be the major beneficiaries of the funding.